When not buckling his swash or shooting arrows into Orcs, Orlando likes to spend his time delivering milk. It's not easy being almost illegally handsome. That may sound like whining, but it's something Orlando Bloom and myself have to deal with on a daily basis. For me, it's more a minor inconvenience. A gasp of recognition in the lunch line, perhaps an occasional request for a photo op at the airport, and then I'm on my merry way. Not as easy for Mr. Bloom. Particularly with the line of work he's chosen. I mean, the combo of "film actor" with "drop dead gorgeous" is a potent one. But he manages. A more serious issue is, with that kind of punum, there's only so much you can do in film. Unless you're willing to "ugly it up" with some make-up or prosthetics. And all evidence points to the fact that Orlando is not willing to. Hell, even when he puts on some pointy ears, a blonde wig, and some funky contacts, it only makes him more swoon-worthy. Perhaps the man is ugly proof. At any rate, he seems to have found his niche in the film world. And, as it turns out, it's a lucrative one. The niche is "mega-huge box office smash hit star", where he plays to his strengths (the face) and lets the special effects team do the heavy lifting. This is not to say that Bloom isn't willing to try other things. It's just none of his other projects have really panned out as well as starring in the effects heavy fantasy blockbusters. He's tried hefting a sword or bow (often shirtless) in effects heavy "historical dramas" (or, more precisely, "historical fictionalization") like "Troy" and "Kingdom of Heaven". And "Elizabethtown" showed, amply, that he isn't quite as effective as a romantic dramedy lead. 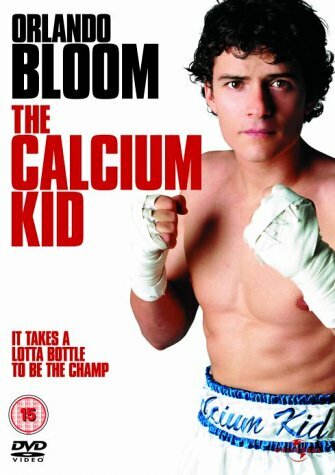 And the subject of this review, The Calcium Kid, shows that straight comedy really isn't Orlando's best suit either (even when the suit consists of nothing more than a pair of trunks and some boxing gloves). The Calcium Kid is a loose remake of "The Milky Way" starring Harold Lloyd (which was also remade by Danny Kaye in 1946 as a musical, "The Kid From Brooklyn", also reviewed here). Like the previous versions, the story revolves around a shy, unassuming milkman, although this time he's named Jimmy Connelly (Bloom) and he's from England. And rather than filming it as a straight narrative, it's all framed as a "mockumentary" of the days leading up to a championship fight. Connelly happens to work out at the same gym as the subject of this documentary, the number one Middleweight challenger in the world, Pete Wright (Tamer Hassan). A week before his big title fight against the Middleweight champ (played by Michael Peña) Wright is rifling through sparring partners at a frightening pace. Desperate to find live bodies, the contender's manager Herbie Bush (played by Iranian comic Omid Djalili, instantly recognizable from his appearance in "The Mummy") grabs the novice Jimmy Connelly and puts him in the ring with Wright. And, predictably, Wright ends up breaking his hand on the milkman's noggin and the championship fight (and the financial wind fall that comes with it) is in jeopardy. Herbie Bush becomes even more desperate until he finally decides to fill Wright's spot in the big bout with the amateur Connelly. And so the "documentarians" decide to follow Jimmy during his whirlwind preparations and all the behind the scenes machinations that take place. It's an odd choice for a remake, as the previous two had a sort of sweetness to them (even in regards to the rough and tumble world of boxing), while this one seems to be aiming below the belt, both in tenor and in sense of humor. Everyone in the boxing business (besides the innocent Jimmy) is played very broadly as scheming and exploitative. Djalili as the manager Herbie Bush is more or less an amalgamated caricature of Don King (minus the upshot hairdo and the denim jacket) and British promoter Frank Warren. All the humor is applied with a firehose (the most egregious offender being the usually dependable Rafe Spall as Jimmy's rapping white boy buddy Stan), with most of it failing to hit it's desired target. And standing by trying to play the straight man is Bloom. He's trying to portray a sort of blinky, wide-eyed victim of circumstance here, but he also fails miserably. It may be unfair, but it's impossible to believe someone as good looking as him would ever be a milquetoast wallflower type. This was the one area of the film where I felt they shined (with one glaring weakness, unfortunately). The gym, while small, looked properly outfitted for training. The equipment all looked up to code, even if the ring was 12 x 12 feet, tops. And if nothing else, Orlando Bloom looks fabulous without a shirt on (although, he and the fictional World Middleweight Champion played by Michael Peña both looked like welterweights at the most). Bloom also acquitted himself well in the training scenes, playing most of them for laughs, but looking properly amateurish in them. The absence of a "he-can't-hit-the-speed-bag-because-he's-a-total-muppet" scene is always a plus in my mind. And kudos to the filmmakers for recognizing that any shots of roadwork are just going to be an inferior copy of the scenes from Rocky, so they went the whole nine yards and just flat out lifted it, even going so far as including a popped-up version of Bill Conte's "Gonna Fly Now". But the high watermark for the film was the pre-Big Fight Finale appearances of British underdog champion legends Frank Bruno and Chris Eubanks. Odds are, if you're not a big boxing fan or British, or preferably both, you won't know who the hell they are, but their appearance here, while brief, was golden. And that was the glorious high before the precipitous fall. The Big Fight Finale was an absolute turd. I won't give away the "surprise" ending, but I will say that the skills showcased were lacking, the fight choreography non-existent, and the pacing, setting, and camerawork were absolutely abominable. It took all the good will of the earlier scenes to keep from being washed out by this terrible ending. I truly wish I could give this one some leeway. Unfortunately the cast and filmmakers are giving me no outs. Aside from the inept performances and a distinct lack of humor for a comedy, there were some severe missteps from both a technical and script standpoint. The most glaring was the failure to sell this as a "documentary". Even when you're presenting your film as a "mockumentary", you have to at least follow the standard rules set out by the genre you're mocking. And at the top of that list is "all action has to be captured by a single camera". You can't say you're a skeleton interviewing team with a narrator and a cameraman, and then have multiple-angle, moving shots of the subjects during candid footage. It doesn't work. But even less forgivable is the decision by screenplay writers Alex De Rakoff, Derek Boyle, and Raymond Friel (De Rakoff also directed) to try and inject their story with some degree of drama towards the end. Mainly it's because they've drawn the characters so broadly and unbelievable, and then they suddenly want us to take them seriously. This also doesn't work. I can see their desire to capture the magic that Christopher Guest and his colleagues created in "Waiting For Guffman", "Best In Show", and "A Mighty Wind". But they're missing the point with trying to do the "mockumentary" with scripted scenes. They needed experienced improv actors and a willingness to let them do "their thing". But instead we get stilted attempts at "spontaneous" humor, and even a shirtless Orlando Bloom can't save that.